This 3 Headed Blue Sea Dragon roars above a tall swell of translucent waves and sea foam. This hand painted and finished Dragon figurine is a perfect addition to any dragon collection. 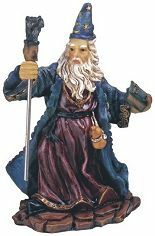 The Wizard Prophet is a finely detailed, hand painted Wizard figurine set on a stone like rock base. The Wizard stands and prophecies in his celestial robes wielding his Crystal Ball and dragon head skull magic staff. Hand painted cold cast resin Wizard figurine. 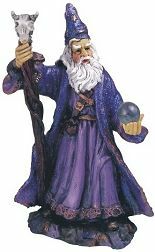 The Wizard Spell Caster is a hand painted Wizard figurine in flowing robes set on a stone like rock base. The Wizard is a traveler on his way to cast out evil dragons and miscreants with spell book and magic staff at the ready. Hand painted cold cast resin Wizard figurine. This hissing 3 Headed Green Rock Dragon is in menacing attack mode above his craggy rock lair. 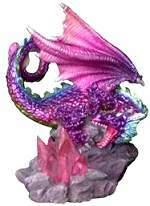 This hand painted and finished cold cast resin dragon figurine comes in a glossy gift box. 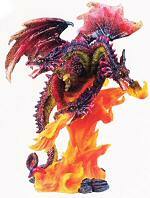 A colorful 3 Headed Fire Dragon figurine sits above a sizzling column of flames. 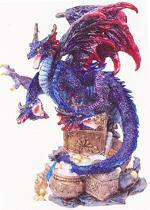 This hand painted and finished cold cast resin dragon statue comes in a glossy gift box with heavy foam packing. The 3 Headed Purple Treasure Dragon guards his gold and jewel encrusted treasure chest. 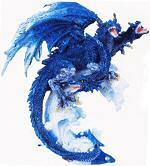 This hand painted and finished cold cast resin dragon figurine comes in a glossy gift box with heavy foam packing. 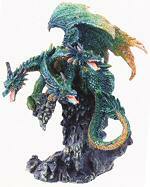 The Dragon of Crystal is a finely detailed, hand painted figurine from the Enchanted Kingdom Collection. The colorful purple hued Dragon fiercely protects his crystal domain.